Seven Barrows maestro Nicky Henderson recorded his 59th victory at the Cheltenham Festival following a record seventh success with Buveur D'Air's game win in the two-mile championship contest. The first back-to-back winner of the hurdling highlight since Hardy Eustace in 2004 and 2005, Buveur D'Air, the 4/6 favourite was always prominent under Barry Geraghty and despite being headed by the Willie Mullins-trained Melon (7/1), the seven-year-old son of Crillon rallied tenaciously under Geraghty to win by a neck in a thrilling finish. The Gordon Elliott-trained Mick Jazz (25/1) was three lengths further back in third; the first three clear. A delighted Henderson said: "It was a brilliant race. They went a good gallop throughout and Buveur D'Air and Melon were able to then keep that gallop up in the closing stages, it was a great contest to keep that up the whole way. "They were two very brave horses, with two brave jockeys. I think he did get headed but Barry said he was never worried as he thought he would always get there. "Buveur D'Air had a battle on his hands, probably his first real battle this year. After his last race at Sandown, we were talking about him not having any really hard races this year, but today was one. "Unlike some of his prep races, this was a proper race and he showed his class. He was headed but Barry was always happy. It was a proper race and Melon is a good horse, but Buveur D'Air just put his head down and battled. "He didn't blow up, but he had a blow afterwards. He is a really good young horse, he did what he had to today. "There's always pressure when you are trying to win these big races, so it's a big relief and it gives us confidence going into the week. "We have four weeks until Aintree, so we could go back there again if there is soft ground in the going description. I'll speak to J P McManus and then we'll make a decision." Winning owner J P McManus was also winning his seventh Champion Hurdle along with his 53rd Cheltenham Festival success and he was equally delighted. McManus said: "I'm keeping up with Nicky! I'm thrilled as Barry missed out last year and whilst Noel gave him a great ride last year, it was nice that Barry was involved and got to share in it and enjoy it. "Barry got the job done and looked strong as did Paul Townend on Melon and Barry just got the better of him. "I thought we had it all to do after the last, but I was hoping that Barry's strength might get us through." Melon, who started a 7/1 chance, delighted Willie Mullins his trainer with his close second in the Unibet Champion Hurdle. "It was a terrific performance from him." Mullins said "at least it vindicated what we thought of him. He just did not face the hood on his previous start. I think he is a horse who is going to improve. He will be better next year. "I am not too worried about the ground, there are plenty of horses who will improve with better ground. "Probably we will keep him hurdling rather than chasing but we will make those decisions later in the season. "I am really looking forward to him. "We may go for the Aintree hurdle with him but my preference normally would be Punchestown. Mullins also trained the 4/1 chance Faugheen who came home in sixth and Yorkhill (PU), commented: "Faugheen just wants a trip at this stage of his career. Ruby got off him and said he just wants a longer trip nowadays. "I may send him over a longer trip at Punchestown or maybe look at the race in Aintree. "It is a bit of a head scratcher. Sometimes horses take a year out. "All of my runners have come back fine." 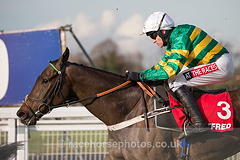 Paul Townend, jockey of the second-placed Melon, said: "He ran a cracker. he was very professional and settled great. "We winged the last and I thought we had our head in front but the line was getting further away in the last 20 yards. "He has so little experience he can only build on that run. He was more professional today than he was in his last run - he is definitely a horse going forward."